In October 2003, Billy Wayne Woods and his family packed into a luxury $181,000 motorhome for a fun getaway to Florida. Call it a textbook American vacation: their destination was Disney World, and with his wife, Shirley, his son and daughter-in law and two grandchildren in tow, the trip would surely be one to remember. But on the return home for the Alabama family, the vacation took an abrupt turn for disaster. Somewhere along I-75 in Georgia, the treads came off the left front Goodyear tire of their Monaco Coach RV. Woods tried to keep the RV under control, according to a lawsuit filed by his family, but it crossed over the median and slammed into an embankment. The nearly 40-foot-long vehicle then hit a direction sign, slid across the entranceway for a rest area, and struck a second embankment, before finally coming to a stop. Both Woods’ wife and his daughter-in-law suffered broken backs; his son, a broken hip. His two grandchildren were uninjured, but the crash left Woods paralyzed. Several months later, he died as a result of complications from his injuries, according to the family’s lawyer. “The underlying story is what tragedies are made of,” said Rick Morrison, an attorney who represented the Woods family in the lawsuit—just one lawsuit of many in a decades-long web of cases that accuse Goodyear Tire and Rubber Co. of aggressively covering up a deadly defect that’s responsible for at least nine deaths. The tire that burst was a Goodyear G159. It was a tire that was designed for lower-speed delivery vehicles and, according to the suits, shouldn’t have been equipped on RVs at all; a tire that lawyers and victims say is responsible for scores of crashes over the past two decades. It should have been recalled or fixed, they say, but it never was thanks to an exhaustive legal campaign by Goodyear that kept plaintiffs from knowing the details of just how bad the G159 really was. In a lawsuit filed later against Goodyear, the Woods family accused the company of selling a defective tire that had been marketed to recreational motorhome makers, even though it knew the G159 couldn’t handle highway speeds when equipped on an RV. The Woods’ case is just one of at least 41 lawsuits filed over the last two decades against the tire company that pertain to the G159. The tire was designed “specifically” for regional delivery vehicles that, company records disclosed in court show, should travel no more than 65 mph. But Goodyear made at least 40,000 that were installed on motorhomes produced between 1996 and 2003. When equipped on motorhomes—commonly used for travel on highways at speeds well above 65 mph—the tires were prone to heat-induced failure, the lawsuits allege, and as early as 1999, RV owners across the U.S. reported accidents due to tread separations and blow-outs with G159 tires. An investigation by Jalopnik found at least nine deaths and 34 injuries are linked to crashes involving the G159 from 2002 to 2009. Those numbers are almost certainly higher in reality: in court, Goodyear admitted it has received at least 98 injury and/or death claims over the tire. Jalopnik reviewed hundreds of state and federal court filings and tabulated for the first time the number of known fatalities linked to G159 blowouts and tread separations. Goodyear’s extensive history with the tire has never received attention from mainstream news outlets, outside of a story by the Arizona Republic in 2015. Despite the accidents and the litany of lawsuits—including one that eventually went up to the U.S. Supreme Court—the G159 was made until 2003, when Goodyear stopped production of the tire. Some deaths and injuries weren’t even reported to federal safety officials, and no recall has ever been ordered. Part of that has to do with Goodyear’s aggressive effort to settle cases, handled by company attorneys who withheld crucial data from plaintiffs, according to a federal judge’s ruling. In each case, judges signed off on protective orders that allowed Goodyear to designate crucial documents, testimony and internal data as “confidential,” and the decisions meant victims of G159 tire failures couldn’t disclose any of that information to other victims with similar claims or regulators. And by getting settlements, complaints and claim data sealed, America’s auto safety regulator says it was prevented from launching an investigation that could’ve prompted a recall—until now. In a filing posted Jan. 1, the National Highway Traffic Safety Administration said it was examining whether the G159 failed because it was put to use on a motorhome, which it was never designed to do. By getting settlements, complaints and claim data sealed, America’s auto safety regulator says it was prevented from launching an investigation that could’ve prompted a recall—until now. Goodyear declined to respond to a list of questions sent by Jalopnik and didn’t make someone available for an interview. In court filings, Goodyear denies there was any problem with using the G159 on motorhomes and the company downplays the significance of its own records and experts in court that points to a serious risk with using the tires on RVs. It’s not an issue of heat, Goodyear counters, it’s user error—deflated tires, an RV that’s overloaded, hitting road debris. “A lot of time people didn’t maintain them with enough inflation pressure,” a Goodyear spokesperson said of the G159 back in 2007. The company recently argued that “no finding of a public safety risk” over the tire “has even been made, in this or any other court” and that it’s up to NHTSA, now with the necessary documents in hand, to make that determination. But compared to defective products from some of the biggest auto scandals in history, the G159's failure rate is astonishing and “unheard of for consumer products,” as one court filing put it. It even eclipses the defective Firestone tires that ensnared Ford in a nationwide scandal some 20 years ago. Federal complaints filed on the G159 show drivers have reported experiencing blowouts as far back as 1999. 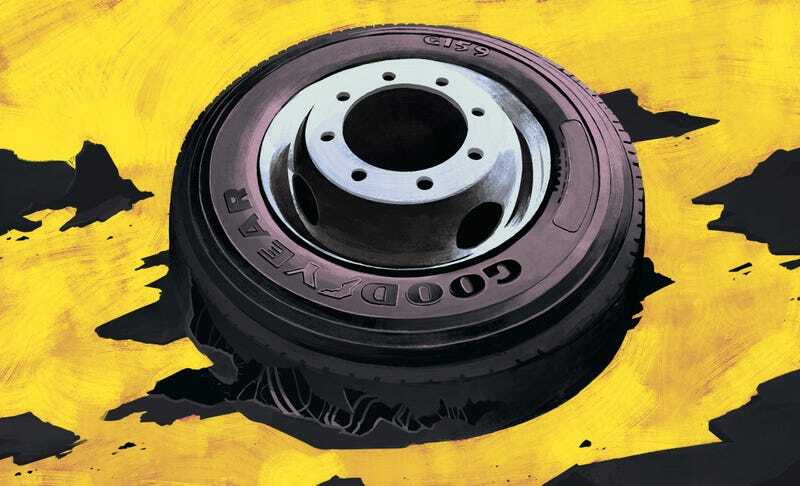 A motorist directly told Goodyear in 2001 about the safety of the tires, after two G159s on their Winnebago fell apart, including one that had only been used for 5,000 miles. The G159's initial tread life is designed to last at least 60,000 miles, records show. Two years later, that’s what happened to the Haeger family—and if you’re wondering why NHTSA has taken nearly 20 years to investigate the safety of the G159, their case is a helpful starting point. In June 2003, the Haegers were traveling in the family’s 38-foot motorhome along Interstate 25 in New Mexico at posted highway speeds when, suddenly, the right front tire blew out. At the wheel was 70-year-old LeRoy Haeger, who was unable to control the vehicle. The RV swerved to the right, off the freeway, over an embankment, before skidding along its side and coming to a stop. In the back of the motorhome were Donna and Suzanne Haeger. Both ended up buried under debris, unable to escape, according to the Haeger complaint. Donna Haeger had multiple fractures—wrist, jaw, ankle, toes—and spent two months homebound in a wheel chair with her jaws wired shut. She suffered permanent facial nerve damage and has trouble eating. According to the complaint, LeRoy Haeger was trapped between the steering wheel and the seat, and his right leg nearly torn apart below the knee. He also suffered a dislocated elbow and abdominal injuries. After 17 surgeries, he still dealt with chronic pain; in 2008, he passed away from cancer. Kurtz represented the family in a 2005 lawsuit filed against Goodyear, the start of a legal battle that has lasted more than a decade and has expanded in ways the attorney couldn’t have imagined at first. “It’s the most outrageous piece of corporate misconduct I’ve seen in 35 years,” Kurtz told Jalopnik. In response to the Haeger suit, Goodyear contended that Leroy Haeger was to blame for slamming on the vehicle’s brakes after the tire blew. Similar to other publicly known G159 cases, the company has said the issue with the tire had to do with overloading motorhomes, under-inflation, or simply driver error. Kurtz requested safety tests on the tire from the outset of the case, but Goodyear lawyers vehemently objected by claiming the inquiries were too broad, until the judge in the case ordered it to respond. Court records show the tires were designed to handle a sustained temperature of 194 degrees Fahrenheit when traveling at highway speeds between 65-75 mph. In excess of 200 degrees, the tire ran the risk of tread separations. But years into the case, Kurtz still hadn’t received test data to show the G159 reached more than 200 degrees when used at highway speeds. Goodyear only turned over some data, but not the highway speed data that he requested, Kurtz said. At the time the case was filed, tire failures were being frequently cited in RV lawsuits, including the G159. Goodyear said it was a sound product. “We never really had a problem with that tire,” Dave Wilkins, then-spokesperson for Goodyear, told Lawyers Weekly USA in 2007. “Most of the situations that came up were application problems. They were put on RVs, but [the RVs] were overloaded,” or owners didn’t inflate them properly. But Robert Ammons, an attorney representing a plaintiff in a tire case unrelated to the G159, said RVs present a risk because they’re infrequently used, meaning the tires are older. But after the Haeger settlement, Kurtz learned there was indeed more to his theory that Goodyear knew the G159 should’ve never been used on RVs in the first place. One day in 2010, he came across a blog post that highlighted a similar case out of Florida involving the Goodyear tire in question. In the summer of 2010, the only trial over a G159 case ever occurred for a case filed by the Schalmo family. The tread of the right front tire to their motorhome separated and, similar to the Haegers, ended with a serious crash. The Schalmos won a $5.6 million verdict. But unlike the Haegers, the Schalmo family forced Goodyear to turn over test data that Kurtz had never seen. Due to the settlement, Kurtz couldn’t reopen the Haegers’ case, so he sought sanctions against Goodyear’s attorneys for hiding evidence, kicking off another legal battle that continues today. After wrangling with Goodyear in court, the company finally handed over test data revealed in the Schalmo case, which portrayed the G159 in an entirely new light: as it turned out, Goodyear’s own test data showed the tires ran at temperatures as high as 229 degrees, far beyond their capacity. Goodyear’s legal strategy started to make more sense to Kurtz: the company’s attorneys would turn over evidence in one G159 case, convince a judge to issue a protective order barring plaintiffs from sharing documents with other attorneys in similar cases, and then secure a confidential settlement, preventing anyone in the case from speaking out. That’s why some evidence would show up in one case, but not another. Illustrating the complexity of the situation, NHTSA says that federal law didn’t require Goodyear, one of the largest tire manufacturers in the world, to report some of the claims to regulators. Goodyear reported only nine incidents to the agency involving the G159, the filing says, which included one death and 13 injuries—far short of the publicly-known total that’s linked to the tire. But Judge Roslyn Silver, the federal judge overseeing the Haeger case in federal court, thought Goodyear’s intentions were obvious. “From the very beginning, [Goodyear and its attorneys] adopted a plan of making discovery as difficult as possible, providing only those documents they wished to provide, timing the production of the small subset of documents they were willing to turn over such that it was inordinately difficult for Plaintiffs to manage their case, and making false statements to the Court in an attempt to hide their behavior,” Silver wrote in an order. In 2013, Kurtz launched a second court battle on behalf of the Haegers against Goodyear in Arizona state court, where he started peeling back just how much the company knew about issues with the tire. According to filings in that case, Goodyear’s internal data shows it has received nearly 3,500 warranty returns for the G159, more than 600 property damage claims not tied to litigation, and 41 lawsuits arising out of G159 failures. The company also identified at least 98 death or injury claims. In court filings, Kurtz included statistics from the August 2000 Firestone tire recall for comparison. The industry typically measures failure claim rates in a “parts per million” basis, court filings show, and Goodyear testified the accepted average is 3.4 ppm. It wasn’t until last summer that Kurtz finally secured a court order that allowed him to send certain documents to NHTSA for review and consideration of a possible probe. “There’s no doubt this tire was defective and Goodyear should’ve pulled it years ago,” Kurtz said. Now, after 20 years of quietly being fought over in court, a more complete picture of Goodyear’s knowledge of the G159 tire has come into focus. Here’s what’s clear: starting in 1996, Goodyear commenced manufacturing of the G159, which it later said was “designed for pickup-and-delivery trucks in commercial service.” The tire also fit motorhomes, so it was used for those recreational applications, too. Over an eight-year period, the company made 160,683 G159s, but it started receiving alarming reports about tread separations almost from the moment they were installed on RVs, according to internal memos cited in court. “GOODYEAR DENIED ANY RESPONSIBILITIES,” a driver later wrote in their complaint to NHTSA. When the tire was first made in early 1996, the G159 was speed-rated at 65 mph max. Shortly after, however, some states increased their speed limits to 75 mph. By June 1998, Goodyear responded by increasing the G159s rating to 75 mph, even though its own data “revealed that that if Goodyear approved an increase in the speed rating of the tire to 75 mph, the tire would generate temperatures well beyond the design capacity of the tire, producing predictable tread separations, with resultant death and injury,” the Haegers say in one court filing. It was a turning point, to say the least. That October, Goodyear representatives met with Fleetwood RV owners at a rally in Louisiana. The company was advised about numerous tread separations and learned that some owners drive their motorhomes up to 85 mph, according to an internal memo. Overall, there was a “strong concern” about blowouts and tread separations, the memo said. Still, crashes continued to rack up. In a four-day span during August 2000, one vehicle owner reported experiencing two tire blow-outs; the second incident sent the vehicle flying into oncoming traffic. Thankfully, there was no accident or injuries reported. But two blowouts in such a short span caused enough alarm to prompt the driver to notify NHTSA. “GOODYEAR DENIED ANY RESPONSIBILITIES,” the driver later wrote in their complaint to NHTSA. In the latter half of 2000, Goodyear released what it called its “first-ever radial tire specifically designed for recreational use.” A press release announcing the product couldn’t have been more clear. Whether or not the explicit announcement played a role, three months later, in May 2000, Fleetwood told Goodyear it was going to switch to Michelin tires because of the reported problems with the G159. Goodyear wasn’t pleased, according to evidence disclosed in court. The G159 story has parallels to the massive Ford/Firestone scandal of the early aughts. Similar to Goodyear, both Firestone and Ford executives “fought allegations of tire defects and SUV rollover propensities in private lawsuits, many of which were settled and the documents sealed,” The Washington Post reported at the time. With NHTSA looking into it, now Goodyear might face regulatory scrutiny that attorneys like Kurtz and Morrison sought years ago. Safety groups like the Center for Auto Safety are also wading in by trying to pry loose documents that Goodyear successfully sealed years ago. The Center for Auto Safety called for the release of documents related to the G159 in early January. “This case is sort of that on steroids,” she said. Goodyear has fought the request, arguing it should be left up to NHTSA to decide whether there’s a defect and that unsealing documents would violate the protective order in the case. As for NHTSA, when Kurtz secured a court order in the Haeger case to send the agency documents for review, he hoped it would initiate a timeliness query, a sort of expedited investigation it has deployed in the past for situations like the GM ignition switch scandal. NHTSA declined, and instead opted to launch a regular probe. Still, Kurtz is hopeful. NHTSA couldn’t operate without the necessary G159 data in hand. Now, he says, it can move forward. Call it a dark twist of irony, but, 15 years after he first approached Goodyear about the significant crash involving the Haeger family, Goodyear’s still requesting NHTSA to keep certain documents it wants deemed confidential. It’s common for companies to issue confidentiality requests during investigations like this. The problem? Some of the documents Goodyear’s referencing have been public for years. “I believe this public information, which is otherwise buried in hundreds of judicial filings should be part of any public filing by NHTSA related to any investigation as it directly relates to a defect determination and Goodyear’s failure to comply with applicable law,” Kurtz wrote in a Dec. 29 letter to the agency. Kurtz also told Jalopnik he requested NHTSA to refer the case to the U.S. Department of Justice for a possible criminal investigation. What makes the entire situation so peculiar is how long this issue has festered quietly in courts for so long without any significant regulatory action being taken. Despite the sprawling legal battles, RV forum discussions, publicity, a U.S. Supreme Court case, the G159 is still on the road today. Here’s one driver who bought a motorhome in 2012 with G159s. NHTSA’s most recent complainant on file relays “three separate incidents” with the tire in 2010 “where the sidewalls blow out.” The G159 is readily available to buy online, if you know where to look. But Kurtz speaks like the weight of the world’s been lifted off him, now that an investigation’s finally underway. He just wants the world to know about the tire and get them off the road.